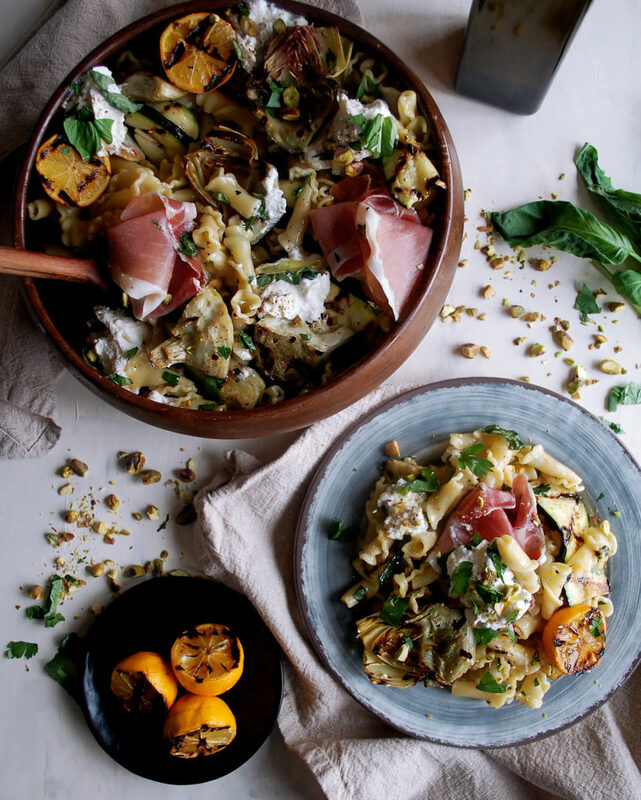 Cheesy, herby, citrusy…this pasta salad has a little bit of everything, and a whole lot of delicious flavor. When I made this pasta salad on a Sunday afternoon, it was meant to be saved for dinner that night. 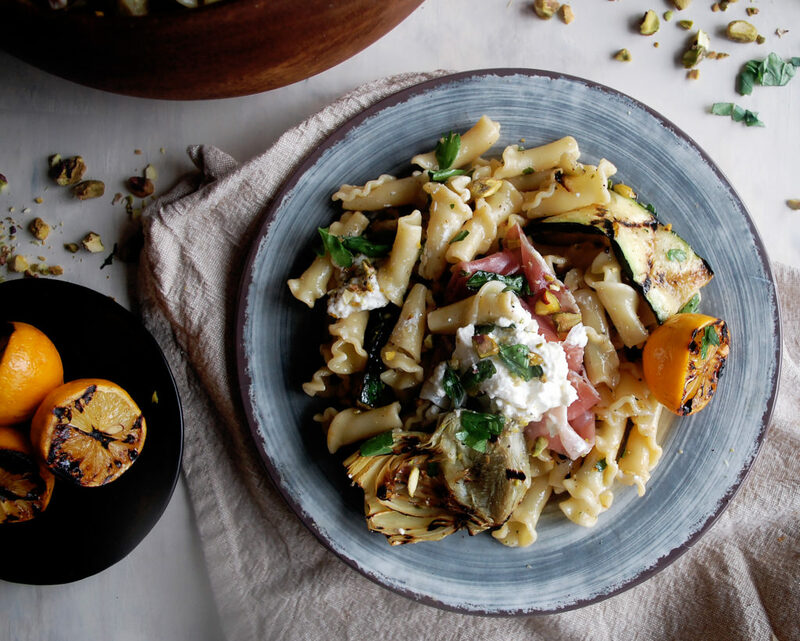 I thought it’d be so perfect…we needed a simple dinner, I knew I wouldn’t feel like cooking after making a mess in the kitchen all day, and this pasta salad basically contains all you need for a light, spring meal. Well, within about 10 minutes of shooting this, it was gone. Completely devoured by myself and my family. We ended up going out for dinner. That’s how good this pasta salad was. Not going to lie, I wasn’t expecting too much from it. 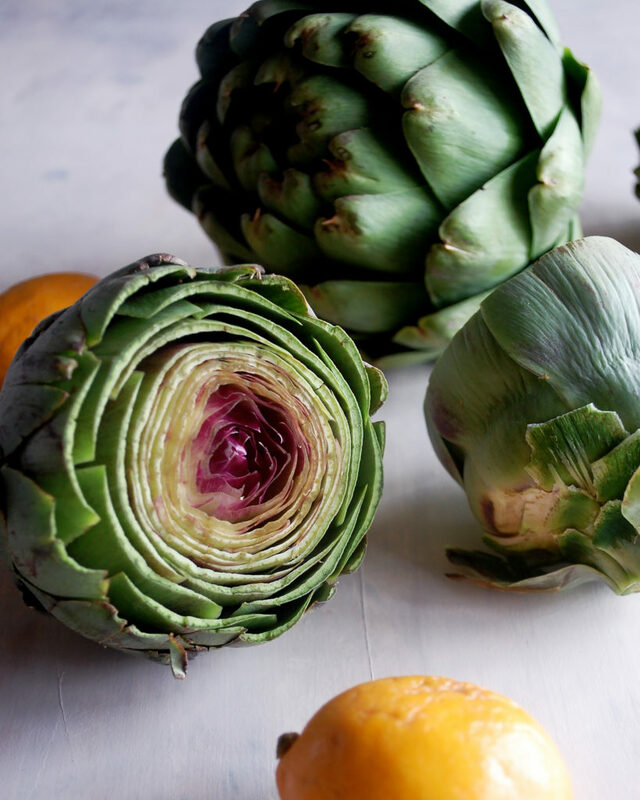 I knew I wanted to play around with cooking artichokes, because after all, it’s spring and they are looking gorgeous. I also knew that I wanted to make some sort of tangy lemon dressing, and I found the cutest baby Meyer lemons to grill up and juice. From there, I really didn’t know what was going to happen with it. I don’t make or eat pasta salad too often, but for some reason I was really in the mood for it. Just the idea of it sounded fresh and tasty. For not being too into it at first, it’s amazing that this recipe is now one of my favorites on the blog. The flavors, textures, and just everything about it is irresistible. Grilling the lemons extracts so much deep, sweet flavor. I juice them and just whisk that up into a simple dressing with lots of fresh herbs. The pasta gets tossed with the dressing and at that point it’s important to taste. Adjust the seasoning to your liking, but I added a generous amount of salt to get all the flavor of the dressing to come through. Since it’s spring, I got some artichokes, as well as a few zucchinis, and grilled those up as well. If you’re new to working with artichokes, this article on how to clean artichokes should be helpful. 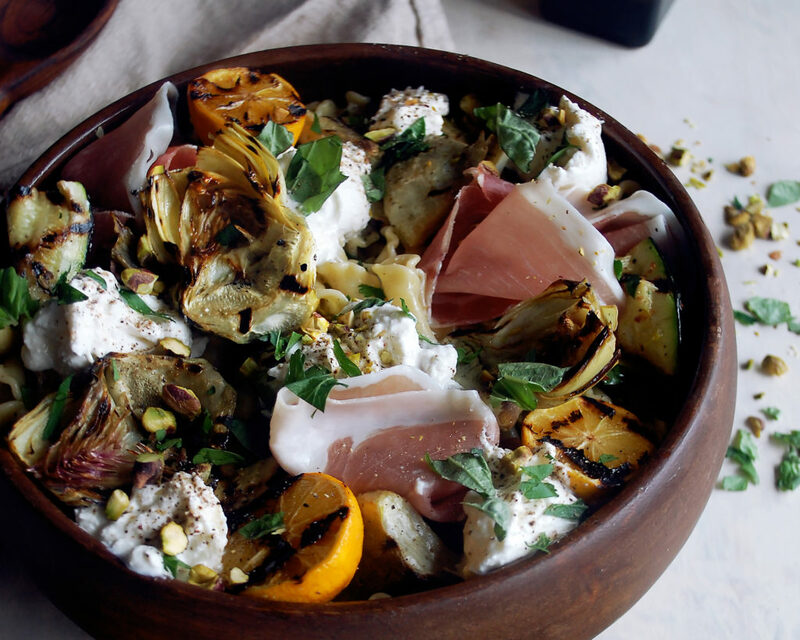 Once the veggies are tossed in, all that’s left are the two BEST ingredients: burrata cheese and prosciutto. I mean, you cannot go wrong there. I make sure to season each piece of cheese, and then I top everything with a sprinkle of toasted pistachios for some crunch. Enjoy! Preheat the grill over high heat. In a small saucepan, combine the wine, water, fennel seeds, and black peppercorns. Juice the lemon into the saucepan and drop in the lemon as well. Bring to a simmer. Add the artichoke hearts. Poach for about 4-5 minutes until tender. 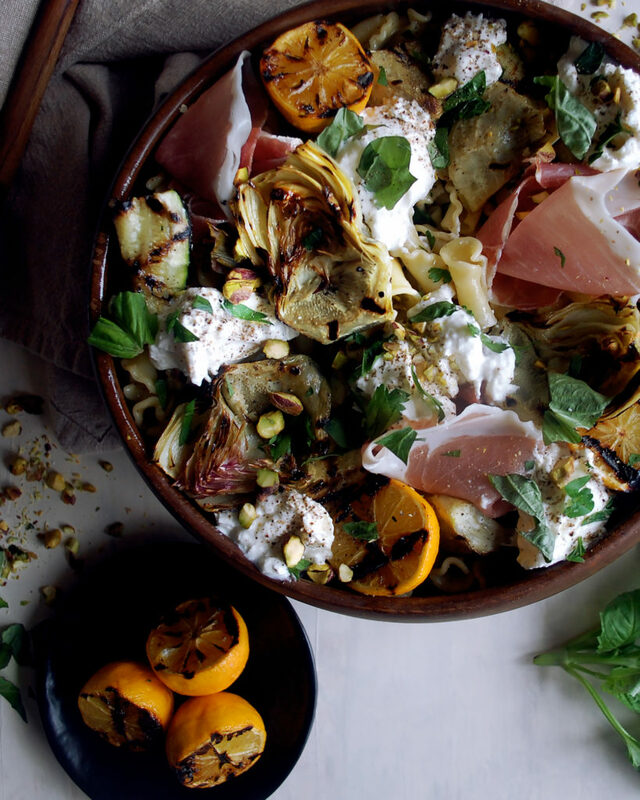 Remove the artichoke hearts and pat them dry. Add them to a mixing bowl, along with the zucchini. Toss the vegetables with oil, salt, and black pepper. Place the vegetables on the grill. Grill on both sides until slightly charred. 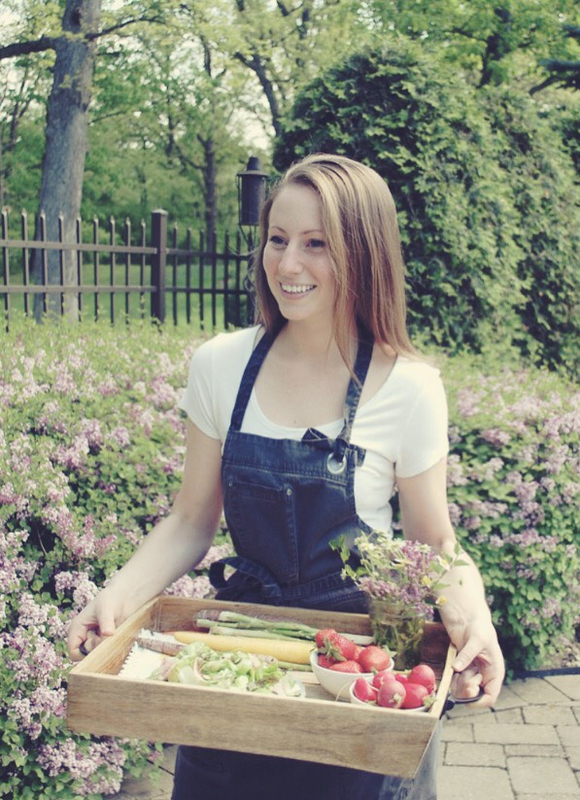 Remove the vegetables from the grill. Slice the pieces of zucchini in half vertically. Let cool. While the grill is still hot, toss the Meyer lemons with oil, salt, and black pepper, and then throw them onto the grill, flat-side down. Caramelize the lemons until they are slightly charred and tender. Let cool. Juice the lemons into a mixing bowl (you want to end up with ¼ cup of juice). Add the balsamic and honey. Whisk until smooth. Slowly drizzle in the olive oil as you continue to whisk until incorporated. Season with salt and pepper to taste. Stir in the parsley and basil at the end. Cook the pasta in a large pot of boiling, salted water. Pour the pasta into a colander and run it under cold water. Let dry. 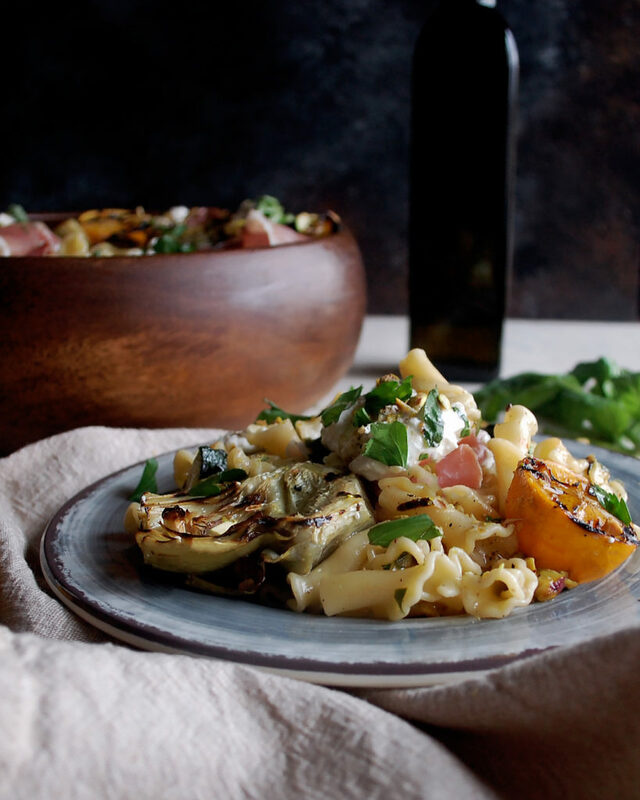 Add the pasta to a bowl and toss in the charred Meyer lemon vinaigrette. Season with salt and black pepper to taste. 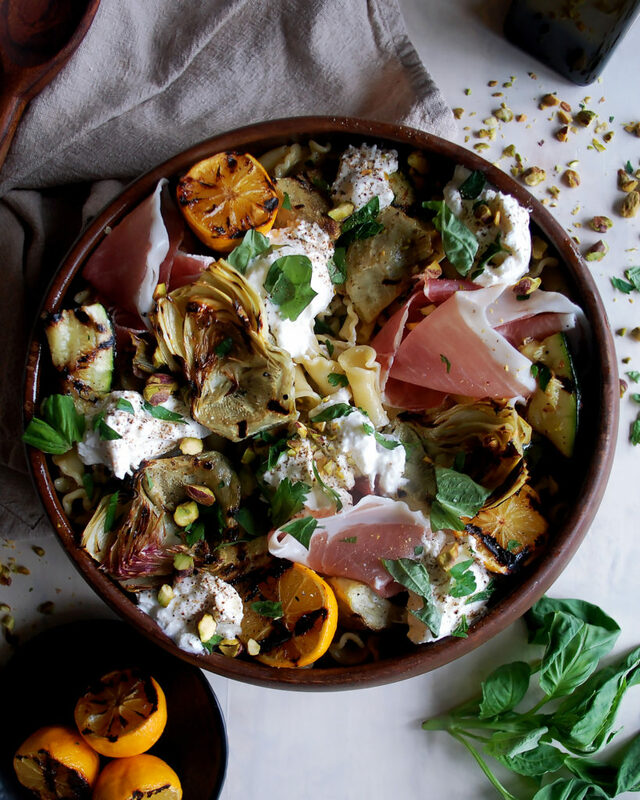 Add the grilled artichokes, grilled zucchini, and slices of prosciutto. 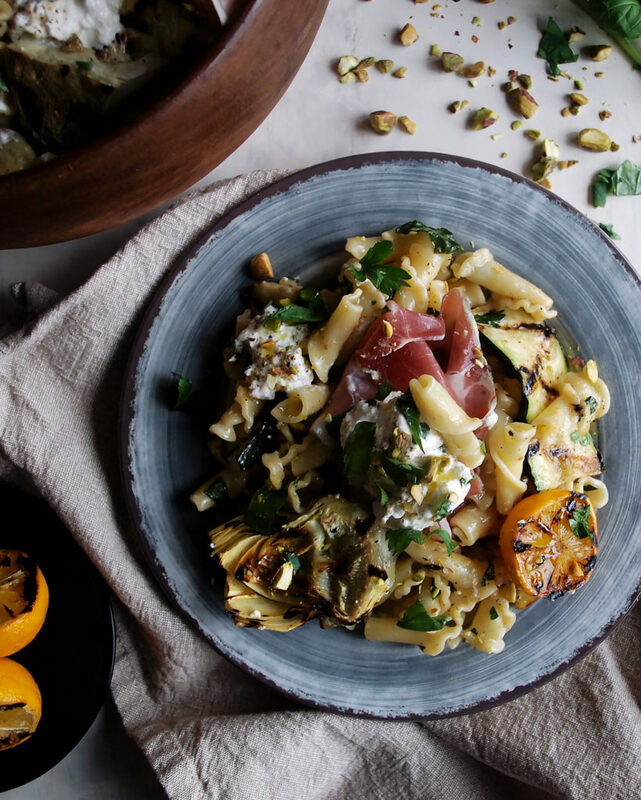 Tear the burrata into pieces and place it around the pasta salad. Season each piece of cheese with salt and cracked black pepper. 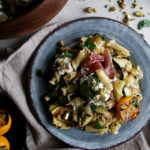 Garnish the pasta salad with the pistachios and a squeeze of lemon.